Yesterday, I did a webinar for the California Lawyers Association on the status of the California Consumer Privacy Act (CCPA). This post recaps the discussion. The CCPA imposes 6 new obligations on covered businesses: they have to make specified disclosures to consumers, provide consumers with a data erasure capacity, provide consumers with data portability, allow consumers to opt-out of data sales (or opt-in in the case of minors), and not discriminate against consumers on the basis of personal information. The law also creates a private cause of action for certain data breaches. The CCPA applies to any “information that identifies, relates to, describes, is capable of being associated with, or could reasonably be linked, directly or indirectly, with a particular consumer or household.” It’s my position that this includes any data about consumers, so this definition effectively eliminates the notion of anonymized or unattributed data. The CCPA regulates every business with $25M+ in annual revenues, or 50%+ of their revenues from selling consumer data, or that “annually buys, receives for the business’ commercial purposes, sells, or shares for commercial purposes, alone or in combination, the personal information of 50,000 or more consumers, households, or devices.” The CCPA purports to apply unless every aspect of commercial conduct takes place wholly outside of California. For more detail, see my (slightly out-of-date) 7 page summary of the law. Also, I call your attention to a free event being held on March 21 at SCU comparing the CCPA and GDPR. The CCPA reaches beyond California’s borders. Another big problem not mentioned in the letter: the CCPA was dumped on California’s extensive tableau of existing privacy laws with minimal efforts at harmonization. Almost certainly, some of the pre-existing laws need to be deprecated; and other laws will not make sense unless/until they are conformed. I’m not sure who will do that harmonization work. The AG’s office is hiring privacy lawyers for San Francisco, Los Angeles, and San Diego! 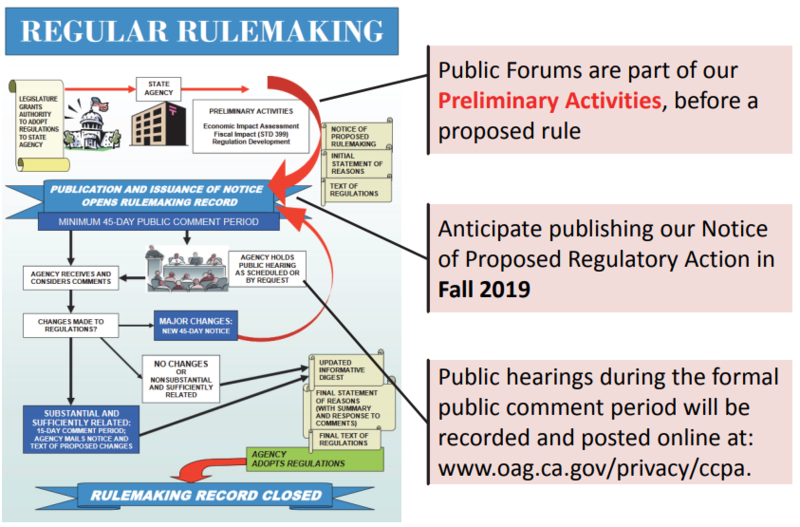 In preparation for their rule-making process, the AG’s office has held 6 “listening sessions,” with one more remaining, in the following places: January 8, San Francisco / January 14, San Diego / January 24, Inland Empire / January 25, Los Angeles / February 5, Sacramento / February 13, Fresno / March 5, Palo Alto. Each listening session starts with the AG’s office presenting this slide deck. Then, audience members get a chance to speak up. Many speakers just read what they’ve already submitted to the AG’s office in writing. There is no reason to believe that the AG’s office will give more weight to oral comments over written submissions, so there is no reason to attend the hearings or get hung up on recaps of the hearings. Still, I’ll be at the Palo Alto session if anyone wants to have a privacy party. Written comments to the AG’s office are due March 8. This is absolutely the best time to get your comments into the AG’s office–before they have put pen to paper. Very few public comments have addressed any of these topics, because most of these issues are far less problematic than the CCPA’s big structural problems. So what will the AG’s office do? Will they restrict their rule-making to the explicit sandbox designated by the legislature, or will they respond to the comments and spread their wings? I fear there will be some diffusion of responsibility: the legislature will think the AG’s office can make rules about whatever they want (that’s literally what the law says), and the AG’s office will feel constrained to defer to the legislature and will only do what the law expressly directs them to do. There will be many bills to amend the CCPA. I don’t yet how many. Here is an incomplete roundup. I expect to testify at the hearing. Looking at the broader context, there are few business allies in Sacramento. Support for improving CCPA will not come from the governor’s office: Gov. Newsom used his State of the State address to endorse CCPA and propose a “data dividend” (presumably, just another tax) from Internet companies. It doesn’t appear oversight will come from the Republicans either (not that they have a lot of clout in the legislature any more); several Republicans already introduced a privacy bill (AB288, the Own Your Own Data Act) to extend, not curtail, CCPA. I don’t see the California legislature having much appetite to fix the CCPA, either. There will be a torrent of post-CCPA privacy regulatory bills soon introduced into the California legislature. As those new bills flood the legislature, it will dilute the time and focus the legislature has to fix the many problems with the CCPA. CCPA is already old news to the legislature, while it’s a lot more exciting to manufacture brand new laws. So the odds of getting serious reform to the CCPA will be undermined by the fervor to pass more privacy laws. Finally, it’s unlikely the tech community will speak in one voice. Apple is bashing its rivals on privacy (including calls for regulating Facebook), and Microsoft has endorsed Washington’s CCPA variant. So legislators will have no problem finding division in the tech community that will give them cover for not taking action. Several states have introduced bills to adopt variants of the CCPA, including Washington states. Bloomberg reports on the efforts in 8 states. This proliferation is bad news. Either the other states’ laws will fix the CCPA’s mistakes (or possibly add their own) and thus increase divergence among state laws, or the bills will copy California’s mistakes and further lock in terrible policy. Either way, no one wins. There have been numerous federal privacy bills introduced. Some propose to preempt state laws; others do not. I’ve said it many times that the sine qua non of a new federal privacy law is state law preemption. Otherwise, it just adds more law and more complexity without fixing any of the problems in states’ divergent or misguided laws (cf. how the DTSA didn’t clean up trade secret litigation, it just proliferated plaintiffs’ claims). From my perspective, a federal preemptive law is the only remaining hope we have to avoid overregulation of privacy that will destroy the Internet and put a serious dent in our economy. Yet that slim hope relies on a dysfunctional Congress, which isn’t reason for optimism. There have been murmurs about Constitutional challenges to the CCPA. There are several angles that could be meritorious. However, I have yet to hear of anyone take any demonstrable steps forward in bringing these challenges. Doesn’t the effective date remain January 1 with the enforcement date extended to July 1 at the latest? You’re correct. Thanks for clarifying.